we programmed a Shader Tool to create on the fly own GLSL Shaders. Of course Shaders are moving and been animated in that tool. i must write a help file and after this, the bublic release will be out. after all it is possible to do some pre work for later Demo Coding. 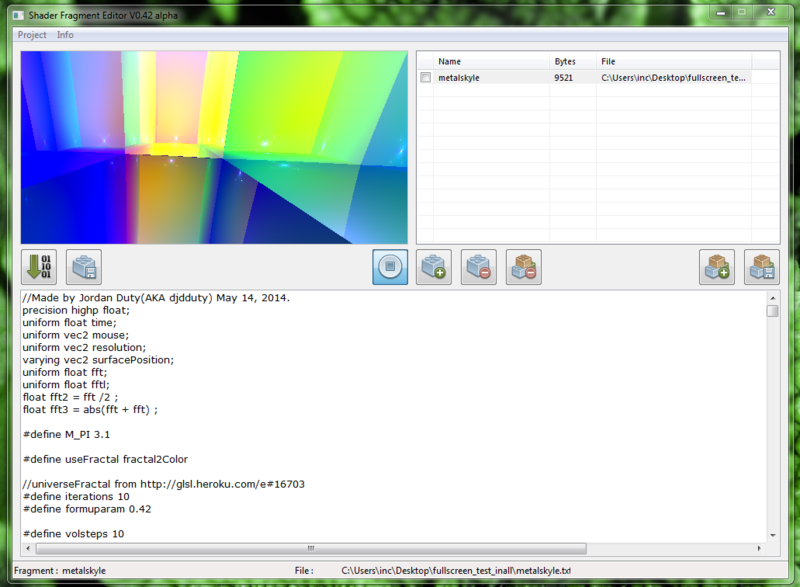 you can write your own GLSL Shader on the fly and export 'em for the PB Demo usage as *.PBI include file. I'll add a Demo PB Script too, to make things easier, starting over with the demo programming. can you bring a lil bit light in the darkness of your code? how did you created the flashing/ flickering bubbles ontop of the GLSL shader? i expanded the GLSL Demo code. now it is possible to call more than one shader and mix 'em to nice effects. this is really frustrating. i used a clean code. Tested your download here and it works inc. But the shader code itself runs quite slow for me. but thats my machine. Coded and provided by inc.
Hi Emook i have tested your GLSL script and it starts then page stays blank. After a few secs my gfx card loses connection and i get directed to this Help page of Nvidia. Im also working on this GLSL PureBasic routine project. And my experience is that the problem with it is how big the GLSL shader routine is and how much shaders/effects it contains and calling from your gfx card. The first post of inc on this topic runs and works for me but very slow. The first makes the GLSL shader run smooth if your machine specs and GFX card supports the routine demands and sec as the name says is loaded and running in Fragments les intensive but doesnt run smooth. There are loads of GLSL shader scripts and routines out there that do look good and work smoothly. Install this GLSL Gallery.Over 11,701 examples now can run on Android. you can see for yourself now wich scripts are to heavy for higher end specs and wich ones run smoothly on most common setups. Level 2 - "2D Desktop"
Goodluck with this cool Purebasic GLSL shader project i hope this info helped a bit. Ok let me look at the code again. It should be quite simple. bass.dll and the sharder data and code inside the main program.